If you’re looking for outdoor adventure in a wonderland of rugged mountains, glacial lakes and rivers in the wide-open spaces of the western United States, there is one place that fits this description to a tee. Glacier National Park, located in Northwestern Montana on the border with the great white Canada was established in 1910 and comprises of more than 1 million acres, 200 pristine lakes, more than 30 active glaciers and majestic mountains, some with elevations of 10,000 glorious feet. Glacier Park in the United States, borders on Canada’s Waterton Park in a marriage of rugged beauty forming the Waterton-Glacier International Peace Park. One of the asphalt highlights of the park is the 52 mile long Going-To-The-Sun Road, considered to be one of the most scenic highways in North America. It weaves a trail that traverses up the towering mountains and then dips gently down into valleys where crystal clear lakes can be found. During the summer season, the park is as active as a live volcano with outdoor activities such as kayaking, whitewater rafting and canoeing. Terra Firma fans can enjoy over 700 miles of trails that can be used for hiking, biking, backpacking and horseback riding. The undisputed Godzilla of the trails in the park is the 100-mile Continental Divide Trail that will take you on a trek to what may seem like the top of the world. Scenery is a mixture of altitude with attitude from high-country alpine to deep conifer forests and magnificent mountain peaks that wear a crown of snow all year round. 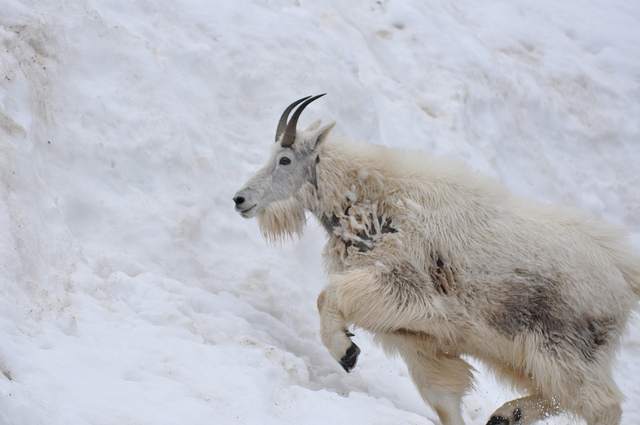 The rugged terrain is home to a variety of wildlife; so don’t be surprised if you have a chance to be up close and personal with bears, mountain lions and mountain goats. Just please remember that this is their home, so respect it. The crown jewels of this rugged country are the ancient active glaciers left over from the Great Ice Age when mastodons roamed the region. The mastodons are long gone, but when the winter snows begin to fall, Glacier National Park is the ultimate winter sports destination. Along with snowshoeing, you can also take to the many trails on cross-country skis. Whatever your preferred method is, the swarms of summer tourists are gone, so the park is quiet and less traveled, which will allow you to enjoy snow, serenity and solitude. There are many trails for snowshoeing from one end of the park to the other, but the undisputed rock star of this Rocky Mountain retreat is the Going-To-The-Sun Road. In winter you can snowshoe it without having to dodge massive gas guzzling RVs or SUVs as the road is closed to vehicular traffic from October to June most years. The road itself has short hiking trails that branch off from the road, so side trips are easily accessible, which will take you deep inside the dense fir forests and grant you the ultimate prize in peace and solitude. 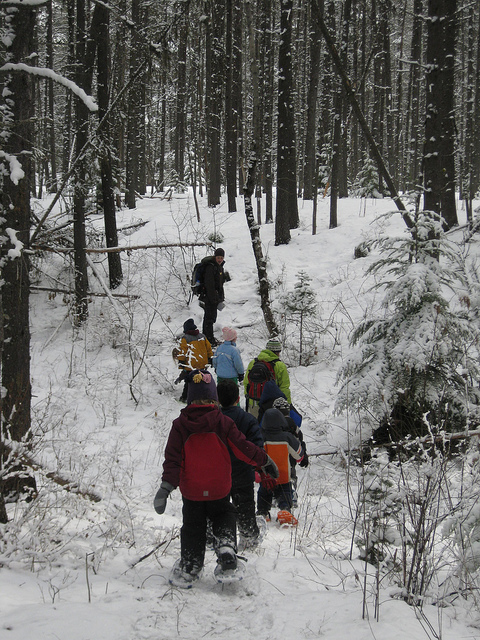 Gearing up for this winter wonderland can also turn into an educational experience on the land itself. Guided snowshoe trips with a park naturalist will allow you to learn about the history and geology of this rugged backcountry beauty. If taking the road more traveled is not your preference, you can also venture out on your own personal exploration. 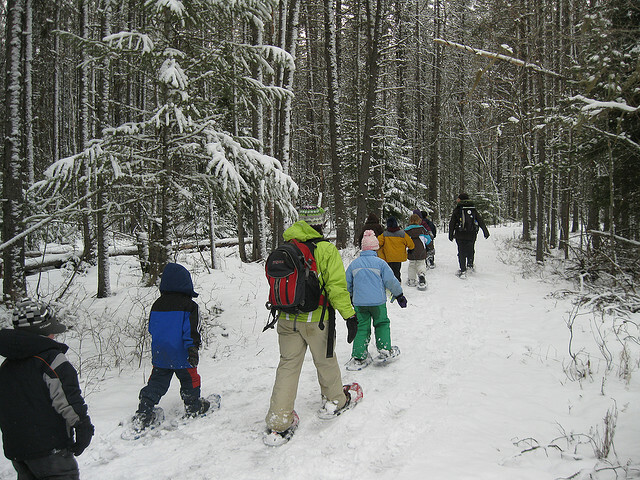 Snowshoe trails vary in length and ability from novice to advance, which will allow everyone to find their own playground in this winter treasure. 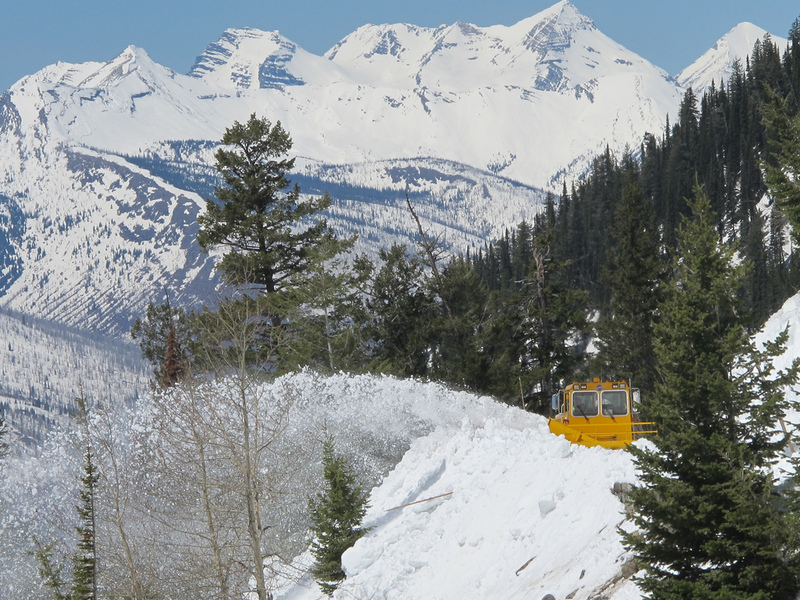 For a complete list of park trails, visit the trails website at www.glacierparkinformation/wintering/trailinfo.html. Besides the grandeur of Glacier National Park, there are also acres of public lands, which allow you to snowshoe or try your hand at dog sledding or snowmobiling. The downhill skier and snowboarder can tackle the powder at one of the ski resorts in the area, and the nearby towns have a variety of micro-breweries and wineries to choose from after a challenging day in the mountains. Lodging in the park is an adventure in luxury. Many of the lodges have rooms and cabins that contain trail heads outside their doors. 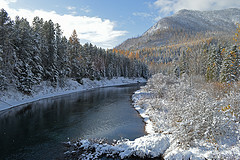 There are also lodging options available in nearby Kalispell and Whitefish. While you’re there, don’t forget to check out the Glacier Sun Winery in Kalispell, which features live music and entertainment in a dinner theater setting that goes perfect with your beverage of choice. What other park offers outdoor activity that can take a snowshoer from the United States into Canada in a single day? However, despite this unique aspect of Glacier Natural Park, please be advised that if you are an American, when re-entering the United States you must present a passport or other photo I.D. to prove it. Be sure to check with border officials before you leave the U.S. side to make sure you follow all the rules so you can get back into the country without a lengthy hassle. Glacier National Park is more than a pleasant experience; it’s the adventure of a lifetime. 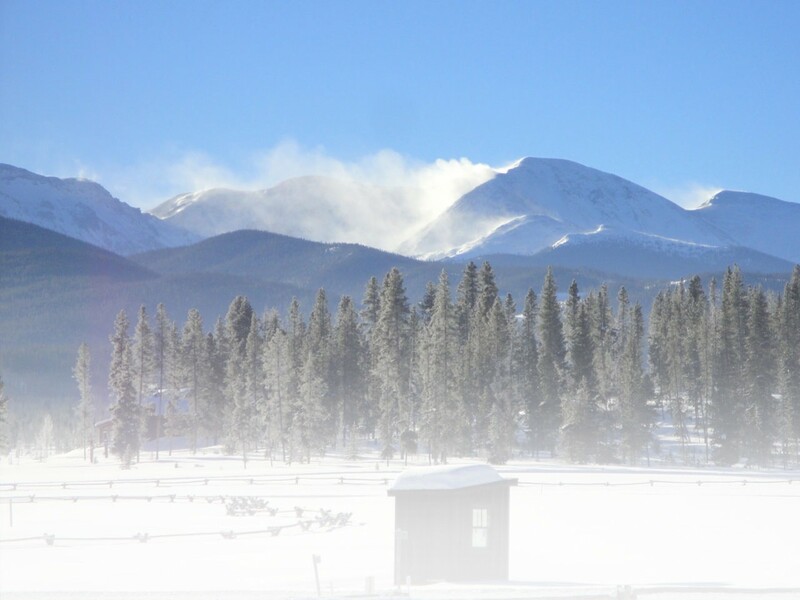 Experiencing the altitude and attitude of this outdoor mecca will serve as the ultimate Rocky Mountain high for anyone daring enough to grab it. This entry was posted in Destinations, Features, Homepage Featured by Mike Marino. Bookmark the permalink.